Not because dribbling is a tough skill to improve necessarily, but because it's difficult to teach players when, where, and why to use their dribble. "You dribble to score, not to explore." That's something all coaches and players need to remember. 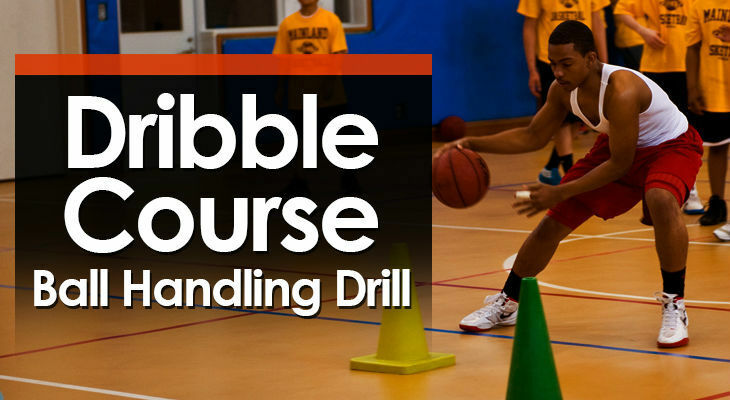 The following 5 basketball ball handling drills will assist players to learn the basics and put them on the path to becoming an efficient dribbler. Players dribble around a designated area while avoiding 1 - 2 defenders who are attempting to steal the basketball off the rest of the players. The coach circles the playing area holding up numbers between 1 - 5 and the dribblers must call out the numbers while evading the defenders. When an offensive player fails to call out a number or has their basketball stole, they’re out. A fun dribbling drill that forces players to keep their heads up and focus on the the coach while evading defenders. This is important so players can read the other players on the court instead of looking at their defender. Decide on a playing area depending on the number of players you have. This can be the key area, within the three-point line, or a designated area using cones. 1 - 2 defenders without a basketball. The rest of the players have a basketball and start inside the playing area. The coach stands outside the playing area. On the coach’s call, the drill begins and the offensive players start dribbling around within the designated playing area. The defenders run around looking to deflect or steal the basketball away from the other players. The coach will then walk circles around the playing area holding up numbers from one to five. 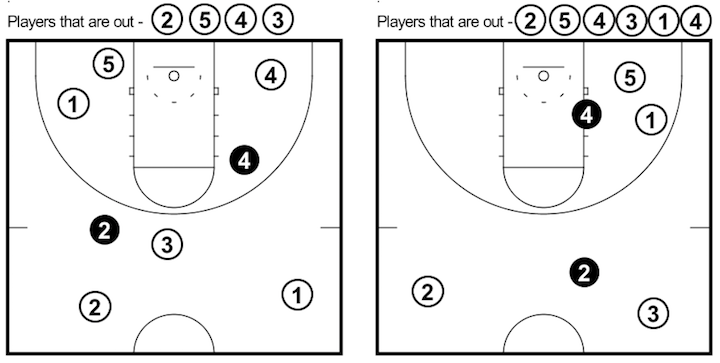 The players must immediately call out the number the coach holds up or they’re out. It’s up to the coach to decide which players failed to call out the number. If a player has their basketball stolen or deflected out of the playing area they’re out. The last player left in is the winner. Coach Doesn’t Move - Instead of walking circles around the playing area, the coach can simply stand at the top holding up numbers. Number of Defenders - Select the number of defenders depending on the amount of players you have. This will vary depending on the level but there should generally be 1 defender for every 5 - 8 offensive players. Opposite Hand Only - A fun variation is to instruct all offensive players to dribble only in their opposite hand. This usually means the drill will end quickly. Offensive players should be in a low stance and have their arm bar up protecting the basketball at all times. The defenders must not foul. If an offensive player is fouled while having the basketball stolen from them or deflected, they stay in the drill. Players should be shouting out the number the coach is holding up loudly. The coach should be 100% sure each player called out the number. Players complete a course that will allow them to practice different dribbling moves. The coach can customise the drill to what their team needs to work on. 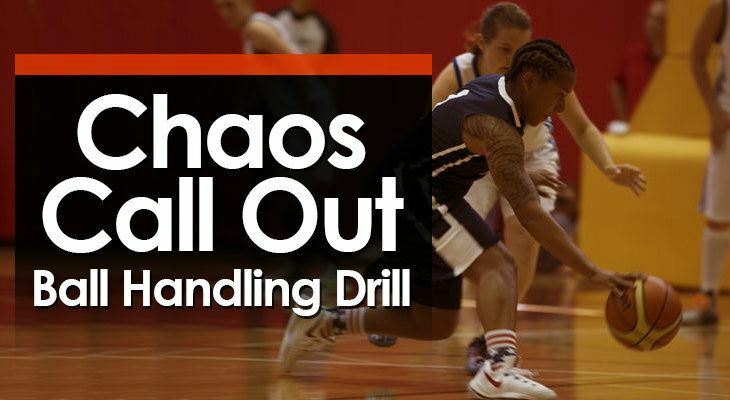 The drill is designed to improve the dribbling and ball-handling skills of the players on your team by working on different moves that they would use throughout a game. Every player has a basketball. All players begin the drill on the baseline in the corner of the half-court. Cones or D-Men if you have them. The drill begins with all players on the baseline with a basketball. The first player in line completes the dribble slalom through the 3 cones. They then speed dribble to the corner before slowing down and completing a reverse spin at the corner. After the first player has completed the reverse spin, the next player in line starts. Players then perform a retreat dribble at the next set of cones. They then perform a wider slalom making sure to use both hands. Finally, they finish the course with a layup, midrange shot, or three-point shot before joining the end of the line. 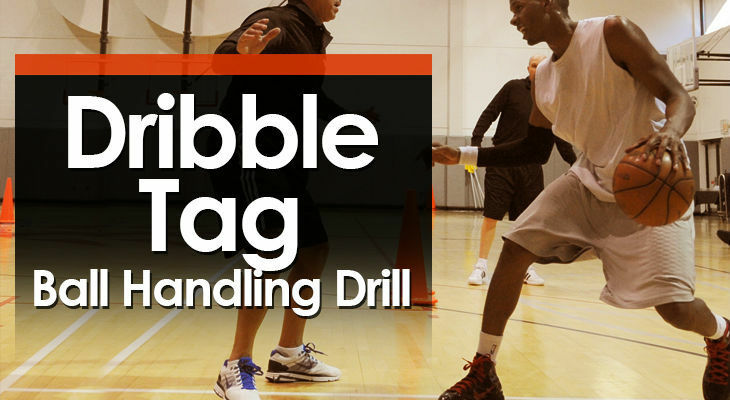 Create Your Own Course – Improvise and experiment with a different types and combinations of dribbling moves. The list of potential courses you can create is endless! Weak Hand Only — A fun variation I sometimes use in the drill is to get players to only use their weak hand. Doing so will get them out of their comfort zone and improve it. Players must keep their heads up while completing the course. The course must be completed at game speed. Encourage your players to push themselves! Make sure to go through all the different stations/moves with the players before starting the drill so that they understand how to perform them. Every player starts the game with a basketball. The coach selects one or two players who are the taggers and they must attempt to tag everyone out. When you’ve been tagged, you must sit on the sideline or the baseline and wait until the next game. Similar to scarecrow tiggy, this drill is great for improving dribbling skills because the dribblers have to focus on the taggers and not their dribble. The coach first decides on the playing area which will depend on the amount of players you have. All players start the game with a basketball. The coach selects one or two players to be the taggers. On the coach’s call, the taggers must dribble around the playing area attempting to tag the other players. The other players must dribble around without committing a dribbling violation and avoiding getting tagged. If a player does get tagged, they are out and must sit down out-of-bounds and wait for the next game. Taggers Don’t Dribble - If the taggers are having a lot of trouble getting other players out, consider allowing them to run around without dribbling. Two Balls - If you have enough basketballs for two each and your players are skilled enough, give each player two basketballs that they must dribble while the taggers only have to dribble one. If the taggers are struggling to tag anyone, consider allowing them to run around without having to dribble a basketball. Vary the size of the court and amount of taggers depending on the amount of players you have. ​If a dribbler commits a dribbling violation, they are automatically out. Players find a partner and stand 2 metres away facing each other with a basketball. One player is the leader and one is the follower. The leader continuously performs stationary dribbling moves while the follower must attempt to mimic them and keep up. 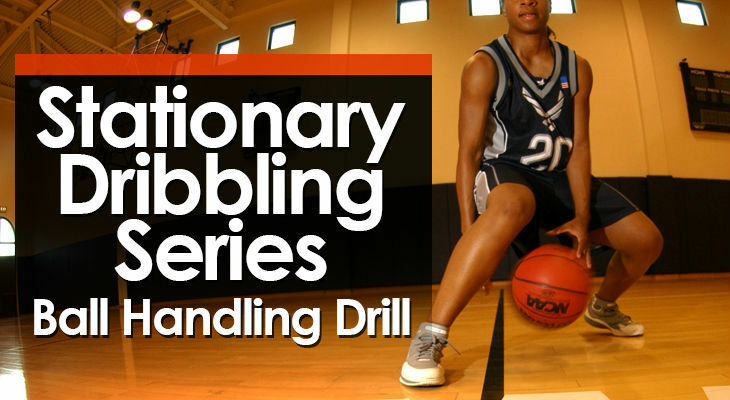 One of the best ball handling drills for improving dribbling ability. The follower is forced to keep their head up throughout the drill and the leader must be creative and constantly improvise. All players find a partner. Every player must have a basketball. Players line up approximately 2 metres away facing each other. The drill begins with the coach choosing a leader from each of the pairs. The coach then starts the drill by calling out ‘Go!’ or blowing a whistle. The leader immediately starts performing stationary dribbling moves or ball-handling moves. The follower must keep their head up and do their best to mimic exactly what the leader is performing. Every 30 seconds the coach must call out ‘Switch!’ and the players swap roles. Two Basketballs - For advanced players, you can have each player controlling two basketballs throughout the drill. Players can either use dribbling moves (behind the back, through the legs, crossover, low dribble, high dribble, in-and-out dribble, etc) or ball-handling moves (around the waist, around the head, around one leg, candy cane, etc). Let them get creative and have fun! Encourage players to push themselves out of their comfort zones. Praise the players who are working hard even if they lose the basketball. 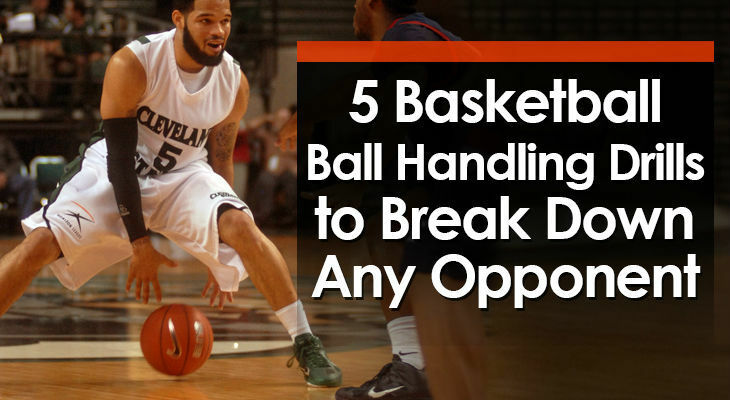 Watch that players aren’t dominating the basketball with their strong hand. All players must be working hard to improve their weak hand. All players have a basketball and find a spot on the floor where they can see the coach and have space to dribble. The coach then takes them through a series of stationary dribbling and ball-handling drills. Simple ball-handling drill to use with younger players. Players work on keeping their heads up while performing a variety of creative dribbling and ball-handling moves to improve their feel for the basketball. Players spread out on one half of the court facing the coach. All players have a basketball. The coach stands at the front of the group with a basketball. The coach stands at the top and calls out a variety of different dribbling and ball handing drills listed below. 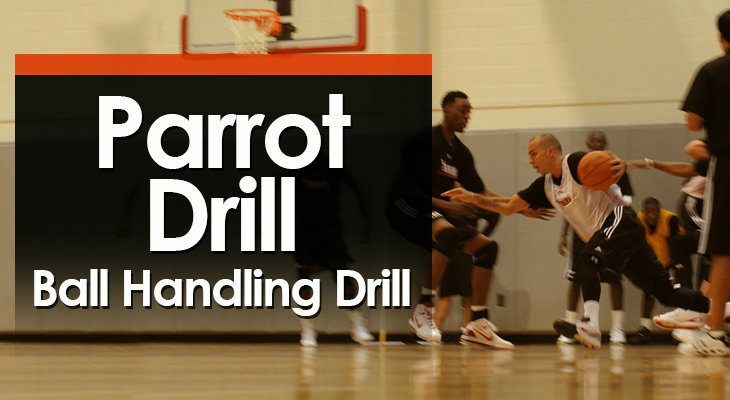 Each drill should last 15 - 30 seconds depending on the level of the players and which drill the players are doing. The entire set should last approximately 5 minutes. Two Basketballs – If the players are accustomed to the drill and maintaining control of one basketball, add a second basketball for each player and complete two-ball drills. Count Numbers Out Loud - A great game to have players to keep their heads up is to hold up numbers from 1 - 5 with one hand. The players must keep their heads up while performing the drills and yell out which number you’re holding up. Encourage players to push themselves out of their comfort zone once they understand the drill. Players should be making occasional mistakes or they’re not going hard enough. Use drills that you think are slightly out of the ability of the players you’re training. It’s a great way for players to get creative and improve their dribbling. Don’t allow the players to simply go through the motions!